In September: Dunn Bros., 34th & Hennepin, Mpls. Minneapolitans can lose sight of the fact that they live in a truly beautiful city. When you travel outside the state, you’ll run into people who call Minneapolis the San Francisco or the San Diego of the Midwest. When I’ve entertained friends and relatives from other parts of the country and the planet, they are without exception struck by the city’s natural and human-made beauty, from the lakes to the parks to the skyline to various architectural structures and public art that exude their own special identity. (l to r): Taj Ruler, Matt Erkel, Bobby Gardner, Lauren Anderson, Andy Hilbrands, Josh Eakright. Photo by Dani Werner. The Rainbow Election: Mommies and Mormons and Gays, Oh My! For too long the region’s premiere comedy troupe has presented average and even below average work, but finally, the Brave New Workshop has roared back with their best show in years with this brilliantly astute spoof on both major political parties. It’s not the fatuous fingerpointing that too often, too easily, ridicules and mocks politicians. It’s a sharply focused look inside the hypocrisies and contradictions of both die-hard Republicans and Democrats and the two men they currently champion. For Obamacrats who lazily think that the only criticism about their man comes from the Tea Party/GOP, they need to get a clue that, as with the Clintons, there is ample and compelling criticism of him from the Left of the Democratic Party and from just plain old basic objectivity. Beefy Obama criticism has been shut out by much of mainstream media and which can be found primarily at marginalized but serious outlets like democracynow.org and alternet.org. And this company collaboration directed by Caleb McEwen doesn’t shy away from that beef. Throughout, Obama (Andy Hilbrands) is shown up for his record number of deportations, his Kill List, his horrific drone attacks, his extension of Bush tax cuts for the rich, and his health care plan that enriches insurance companies and of which a similar version has been championed in the past by US Congressional Republicans and Romney. Both sides are exposed for their profound hypocrisy on this count. Nothing fatuous about that. Hence, in turn, Democrats are shown as having a double standard for condoning tactics by Obama that they would have pilloried George W. Bush for. To point, Obama has ratified the Bush Doctrine, in the same way Clinton ratified Reaganism. But don’t worry Obamacrats, your man, played splendidly by Hilbrands, is shown as a genuine victim of racism. There’s no doubt about that. So you can take some solace there because Tea Pary zealots do indeed have it out for him, no doubt about it. The scenes where people react to him like Pavlov’s dog when he wears a hoodie are satirically terrific. There’s also a great scene where the dynamic Lauren Anderson plays the only woman on a panel with three reactionary men we can assume are Republicans. Bobby Gardner reprises the gay stereotype he’s known for, but in this case, as a Paul Lynde version of President James Buchanan, he’s marvelous. It brings up that idiotic notion that some neocon morons have that because Obama is pro-gay he must be gay and therefore is a gay President. But perhaps the show’s best moments are in the empirical comparisons that are made to a group of fanatical Republicans that show disarming similarities between Obama and their deity, Ronald Reagan. James Roop’s projections are inspired with an image where Obama is altered to make him look whiter and blonder, hence more acceptable to a GOP test group. The Romney family is spoofed and the Mormon magical underwear mystique is mischievously portrayed by Gardner. Though the Bain Capital issue is not delved into, the show is packed with digs at Romney’s wealth and how that puts him out of touch with average Americans. Without saying too much, there’s another image toward the end that pokes marvelous fun at that mystique as well. 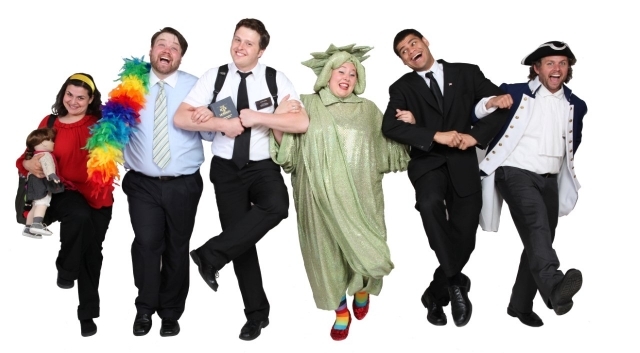 This revue asks us: which group will the US be less tolerant toward—Mormons or gays? And why won’t Obama be more proactive in enabling gay marriage rather than just giving it his verbal support? Guthrie Theater Proscenium Stage, 818 So. 2nd St., Mpls. John Miller-Stephany reminds us what a truly great director of musicals he is. His current Roman Holdiay is yet another sterling achievement among his other sterling musical achievements at the Guthrie—1776 and She Loves Me. As with these, the basic material is stellar. Paul Blake’s 2001 text is injected with numerous tunes by master gay composer/lyricist Cole Porter (1891-1964). For the most part, they buoy the narrative along. You may recognize the title from the 1953 Oscar-nominated Best Picture directed by William Wyler. It comes from a story by Dalton Trumbo who was blacklisted in the McCarthy Era not long before the film was made and who also co-wrote the screenplay with Ian McLellan Hunter and John Dighton. The Guthrie production perfectly balances a big ensemble with principal players. Alex Sanchez’s choreography and Samuel S. Davis’s dance arrangements are packed with glorious swing by dancers who joyously capture the post-World War II zeitgeist that infused the West at that time. We are reminded of the assertion that the modern Sexual Revolution was born out of the ashes of that war. Young soldiers had been flung around the world, away from hearth and home stateside. This meant extramarital sexual experience to an unprecedented degree. Women had proved crucial in the wartime workplace, and in America in the ’50s they were being shelved and defined as homemakers. In Europe, they were grappling with poverty, along with men who often fueled an underground economy. So something had to give. Morevoer, the artists in this production remind us that there was more beneath the pretty surface of the ’50s that’s been handed to us. That zeitgeist is the essence of this musical. The story is of young Princess Anne (Stephanie Rothenberg), who escapes the straitjacket of her schedule after taking an upper prescribed by her doctor. Fatefully, she meets up with an ambitious composer, Joe Bradley (Edward Watts), himself straitjacketed in a dead-end job as a reporter. These two actors are a dream duo. The story challenges the audience to examine ethics in the realms of love, attraction, and monetary gain, and the Guthrie show vivifies that quite lucidly. Envy of young Anne’s privilege is counterbalanced by the psychologically brutalizing duties she is expected to fill. Compare it to those in corporate positions who run themselves ragged at the behest of authoritarian corporatist decorum and hence, lose sight of who they really are. With Joe, one may be tempted to say: “exploit this privileged woman’s naivete along with her physical/emotional attraction to you.” But Trumbo and Blake have built conscience into this story quite beautifully. You exploit at your soul’s peril. Andrew Cooke’s musical direction and Michael Horsley’s vocal arrangements embody Porter and are consistently vibrant. But there are some high points that transcend the others. Christina Baldwin’s fabulously flourishing and sensual Just One Of Those Things with male quartet reminded me of Anita Ekberg in Fellini’s Rome-set film classic, La Dolce Vita. Watt’s rendition of that emblematic Porter tune, Night and Day, quite simply, soars. This summer’s Showboat offering is one of the clearest-cut, old-fashioned melodramas they’ve produced in some time. It’s not that those of recent summers past have not been delightful light fare; it’s just that they haven’t lent themselves to such natural and logical moments of booing and hissing as the current The Vampire which J.R. Planche penned in 1820. Director Peter Moore’s effervescent U of M student cast inhabits C. Lance Brockman’s gothic noir scenic design befitting the 19th century melodramatic tradition. Though there’s a splendid moment of interracial love between a woman and a man that would have been more than frowned on in the 1800s, the largely white audience there the night I attended cheered enthusiastically. Face it: some things do indeed get better! With Ryan Colbert as Lord Ruthven, Vampire moves with menacing grace. Charlotte Calvert’s Lady Margaret is a vivid image of classical maidenhood. Planche’s script may not be a literary masterwork but he crafted some heightened moments which Moore’s staging capitalizes on nicely. Emily Grodzick and Chelsie Newhard enchant as two spirit figures in the opening scene lit with occult flair by Sarah Brandner. Evan Adams charms throughout as M’Swill, the unfortunate stock character who is the brunt of many gags. India Gurley, Zach Keenan, Aeysha Kinnuen, Joseph Pyfferoen, and Tim Murray also lend solid support to the melodrama, as well as the olios – the musical numbers between the scenes directed by Vern Sutton. Though there are points where some voices could be stronger, this year’s olios are some of the funniest in years. Jonathan Singer’s hilariously inspired costumes, like a stole made not of mink, but of cash, and a giant frankfurter outfit, make mischief commentary on greed and—well, you know what I mean. Raye Birk (left) and Peter Michael Goetz. Photo by Michael Brosilow. Guthrie Theater Thrust Stage, 818 So. 2nd St., Mpls. 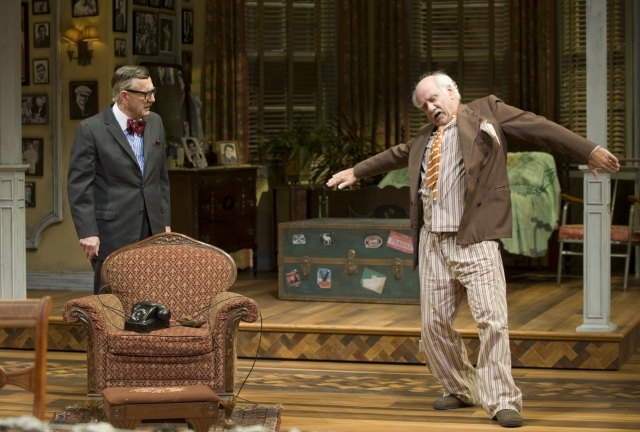 There’s an old saying: ‘There’s no fool like an old fool.’ Neil Simon demonstrates this ugly unsentimental reality in Willie Clark (Peter Michael Goetz), an elderly comedian who continues to blame his comic duo partner Al Lewis (Raye Birk) for leaving him in the lurch when he quit their vaudeville duo, Lewis & Clark, years before. Among other questions, Simon has us muse on just how much we have a right to rely on another for our identity and happiness. When the pair are offered a whopping ten grand for a short appearance on a commemorative TV comedy show, Willie throws up numerous irrational obstacles even though he’s living on the border of poverty. Director Gary Gisselman’s stellar cast plays the raw truth of each moment and reels in the laughs because of that truthfulness. It’s a great time in the theater as well as a searing examination of the wages of grudge-holding and the price of not forgiving. A frank and hilariously funny assessment that you would expect to get in a good Christian church. But since so many churches are so focused on pelvic issues, we have to go to the theater for insight on the problem of the difficulty of forgiveness from a Jewish playwright. And a great playwright, I hasten to add.